I found this recipe on the internet a several weeks ago, thought it sounded delicious and wanted to experiment with the idea. The first time I made exactly by the recipe, we like it but it seemed to be missing a little something. So I thought… lets try with a bit of Ms. Dash, we were introduce to this when Kenny had to stop eating salt in his diet. I didn’t want to over power the dish with herbs so I decided to add it to the chicken only. That time it was perfection. I have also cooked it with fresh rosemary and that too was delicious. In a large bowl, combine the remaining oil, lemon juice, garlic, salt, and pepper; add potatoes, toss to coat. Then arrange around the sides of baking dish. 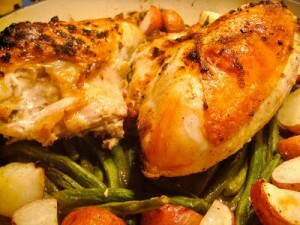 In the same marinate add green beans and toss to coat, place in center of baking dish. Finally add chicken and herbs toss to coat, pour this mix into the pan and spread around evenly. Roast for 50-60 minutes or until cooked through.